DID YOU KNOW that in the annals of America’s heroes, there is scarcely a brighter entry than that of the fighting Sullivan brothers? Born in Waterloo, Iowa to Railroad conductor Tom Sullivan and his wife Alleta, George, Francis, Albert, Joseph, and Madison grew up the best of friends in the closeness of an Irish family and matured into patriotic Americans. 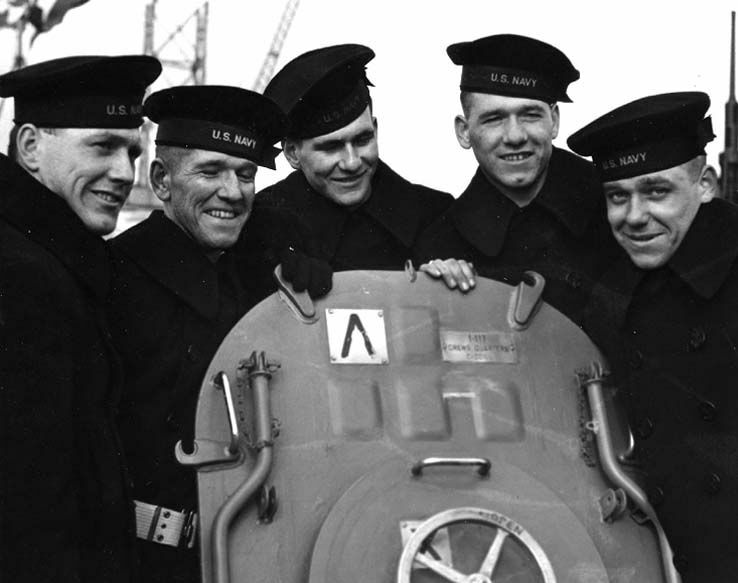 It was no surprise therefore, that when Pearl Harbor was attacked, the Sullivan brothers headed straight for the nearest U.S. Navy recruiting office. 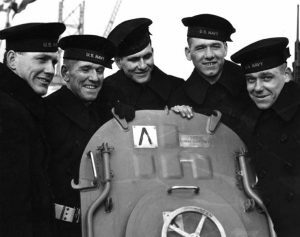 Navy policy discouraged family members from serving together, but the Sullivans were determined that nobody would split them up. If the Navy wouldn’t take them, they would try somewhere else. With the demand for recruitment high, and five healthy young Irish-Americans offering to serve, the request was granted and on Jan 3, 1942, they enlisted. Later, George tried to explain their decision to their mother. His words were tragically prophetic; he said, If worse comes to worst, at least we’ll go down together. In less than a year the worst came to pass. On the morning of Nov 13, 1942, during the battle of Guadalcanal, east of the Solomon Islands in the South Pacific, the Sullivans were aboard the USS Juneau when she was hit by a torpedo in her forward engine room. Minutes later another shot hit her weapons magazine. In a violent blinding flash, the ship erupted. In 42 seconds she sank in shark-infested waters; only 10 of her 711 crew members were rescued; the Sullivans were not among them! The sinking of the Juneau was one of the most tragic losses of the war, but the loss of the five brothers shocked the nation. It was the greatest military loss by any one American family during World War II. The Waterloo Courier reported that, In the history of the Navy, no mother has received a blow as severe as that which has come to this mother. Mrs. Alleta Sullivan endured her sorrow by helping other families overcome their own personal tragedies. Helping others in sorrow kills your own sorrow, she told a reporter. Condolences poured in from every level of society, Presidential letters and visits and even Congressional resolutions could not ease the pain that the nation felt. Hollywood even immortalized the boys in a full-length feature film: The Fighting Sullivans that left those who saw it teary-eyed. The ultimate tribute however, came in April, 1943 when the Bethlehem Shipbuilding Company invited Mrs. Sullivan to christen the U.S. Navy’s new Fletcher-class destroyer, the USS Sullivans (DD537). It would be a fighting memorial to her sons. The USS Sullivans was the first ship ever commissioned to honor more than one person. The Sullivans were on the sea once more. The USS Sullivans received nine battle stars for service in World War II and two more for service in the Korean action. Then on 7 January 1965, USS Sullivans was decommissioned, but remained in reserve into the 1970s. In 1977, she was donated to the Buffalo and Erie County Naval & Military Park in Buffalo, NY as a public memorial. 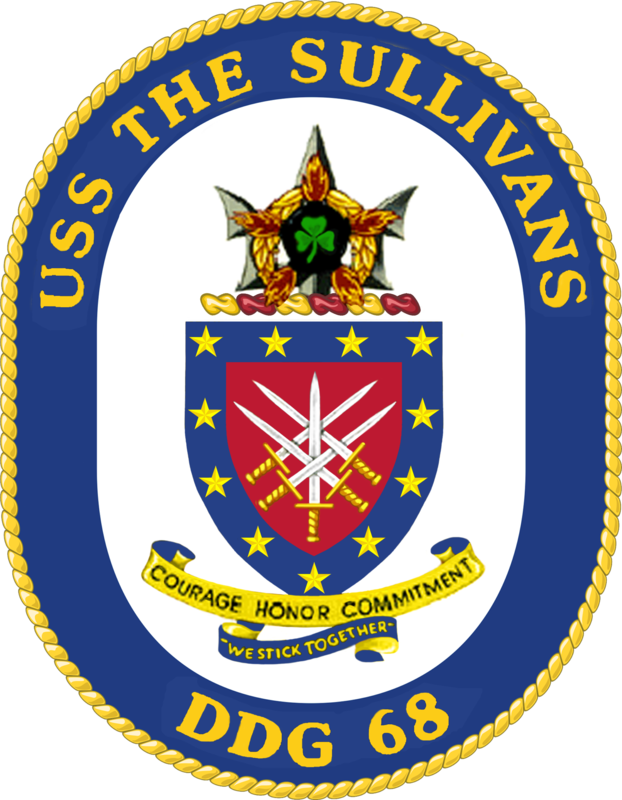 It was declared a National Historic Landmark in 1986 and today, the decommissioned USS Sullivans sits proudly at Buffalo’s Naval Park with her shamrock flag still waving from her mainmast and a brass plaque on her quarterdeck recalling the vow of the five Sullivan brothers – We stick together! However, that’s not the end of the story. The USS The Sullivans (DDG-68), Arleigh Burke-class Aegis guided-missile destroyer was launched on 12 August 1995. She was christened by Kelly Ann Sullivan Loughren, the granddaughter of Albert Sullivan – one of the brothers. 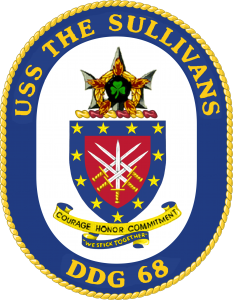 This newest ship to carry the Sullivans’ name was officially commissioned on 19 April 1997 and still carries the name of the five Sullivan brothers across the seas with her official motto: We Stick Together commemorating just a few of the Irish-Americans who made America Great!